Ed v. Candy is just one in a suite of advertising videos that Brown & Crouppen has released under the umbrella title, “BCTV.” The video ads are designed for Facebook and YouTube. They’re offbeat, slickly edited — and viral. Ethics lawyer Michael P. Downey contends one of the state Supreme Court rules mandating legal disclaimers is blatantly unconstitutional. Accusations abounded as Terry Crouppen and Mark Levison sparred over the issue of lawyer advertising at Bar Association of Metropolitan St. Louis’ Bench & Bar Conference. 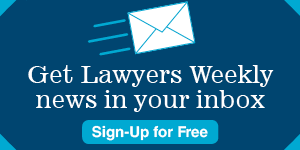 Read what they had to say about free speech, advertising rules, the role of ads in choosing a lawyer and much, much more. Brown & Crouppen and an ex-associate, John Driscoll Jr., have agreed to drop their claims against each other. No payments were exchanged as part of the dismissal, said Driscoll and his attorney. A mixed bag of headcount additions and declines at the state’s largest law firms rearranged the Big 50 rankings. 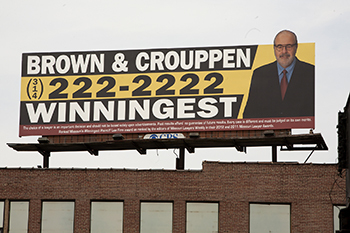 Personal injury firm Brown & Crouppen is mulling a move to Metropolitan Square in downtown St. Louis. Managing partner Ron Brown confirmed the law firm is close to a deal on space at Met Square and said it could be announced this week. Pictured is Ed Herman, Terry Crouppen and Andy Crouppen re-enacting their firm's infamous “barging through the door” commercial with the plaques from the Missouri's Best contest raised high. The annual event by Missouri Lawyers Media was held Friday at The Four Seasons in downtown St. Louis. Click here for a list of winners.